February 11, 2019 – We welcome one of our favorite authors back into our time machine. It’s Neal Bascomb. We last caught up with him in Nazi-occupied Norway for the bone-chilling tale of The Winter Fortress: The Epic Mission to Sabotage Hitler’s Atomic Bomb. 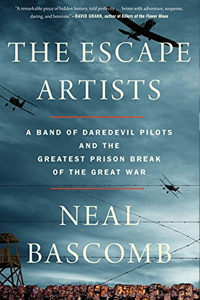 Neal’s latest book is The Escape Artists: A Band of Daredevil Pilots and the Greatest Prison Break of the Great War . It’s the tale of Allied airmen set out to defeat Kaiser Wilhelm’s dreaded prisoner of war camp, Holzminden, and outwit its infamous commandant, Karl Niemeyer who swore that no one would get out alive. Dipping into memoirs and letters seen for the first time here, Neal Bascomb brings this forgotten story to life, in a rare bit of encouraging news for the home front during the darkness of the Great War. It’s a legacy of innovation that not only taught captured allies escape in far greater numbers when World War 2 arrived, but that informs how we prepare military personnel for capture to this day. Visit our guest at NealBascomb.com, follow him @NealBascomb on Twitter, or like him on Facebook at Neal R. Bascomb.